On one occasion, one staff member had to return home for an unavoidable reason. Straight-away, on their own initiative, a second staff member checked to see if anyone was available to work in the absentee's place. This was done automatically without requiring intervention from me, the manager. A boy was changed after receiving a "praise sheet"
In a second example, one boy was bullied at junior high school and now studies at high school. Even when he was employed to work, he was fired not long after. We hired him after being introduced through a staff member, yet he continued to be late and showed instability with his work and his emotions. However he experienced an awakening upon receiving a "praise sheet" at the end of the year. From that point on he showed obvious growth, not only in the kitchen but also out interacting with customers. He showed tremendous initiative and often says he enjoys his job and that he wants to work everyday. In turn his friend visited, also wanting to work. It was clear that he had been told it was a great place to work. They had wound up friends after being victims to bullying and missing school. Manager , Mr Teramoto was very happy with the situation, saying "thanks to Praise management, our staff are able to develop which is directly tied into the profit we make." A part-time staff who studied at a vocational school to be a Japanese sweets maker, always brought the sweets he made at school. Due to Praise-based management, he began to want to work in our company, as a Patisserie and he wanted to be responsible for making the companies sweets. 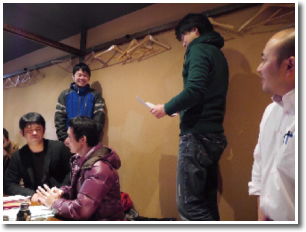 Because of that, he wanted to gain experience in a real shop and create ideas for the menu to spread happiness. "Why here?" I asked him. "Everyone is so accepting, and that atmosphere is fun and fulfilling so I wanted to work here." When I asked what his parents thought it seems they were against it. He used to do what his parents asked of him, but this time he explained how he really felt and what he really wanted to do. Taken aback by his confidence to speak his mind, they then accepted it. He asked them from the heart to let him work.